Pompon Dahlia (Dahlia pompon): growing, planting, caring. A group of dahlias with large spherical flowers. Full description for Dahlia pompon not yet available. The Dahlia genus comprises tuberous plants of the Asteraceae family. The flowers, that come in a variety of shapes and sizes, are every colour except blue. The most well known species is the Dahlia pinnata — but the genus includes more than 40,000 hybrid varieties! Inside: Sow indoors in a warm, well-lit room by February. In a large container filled with fine soil or "seed potting soil", place one seed every inch. Cover with half a centimeter of "potting soil", tamp with the palm of your hand and water gently. Outside: Find a warm, sunny location in a rich, drained soil. Sow from mid-May, in line, every 1 cm. Cover with half a centimeter of potting soil, tamp with the palm of the hand and water gently. Wait until the temperatures are mild and the earth is warm in order to have good growth! Plant your dahlias in rich soil, worked to a depth and surface area of 20 cm, mixing in a it of compost. Pour one liter of water into the bottom of the planting hole, position your dahlia, and cover it with 8 cm of soil. Insert your support stakes at the same time to avoid damaging the tubers. 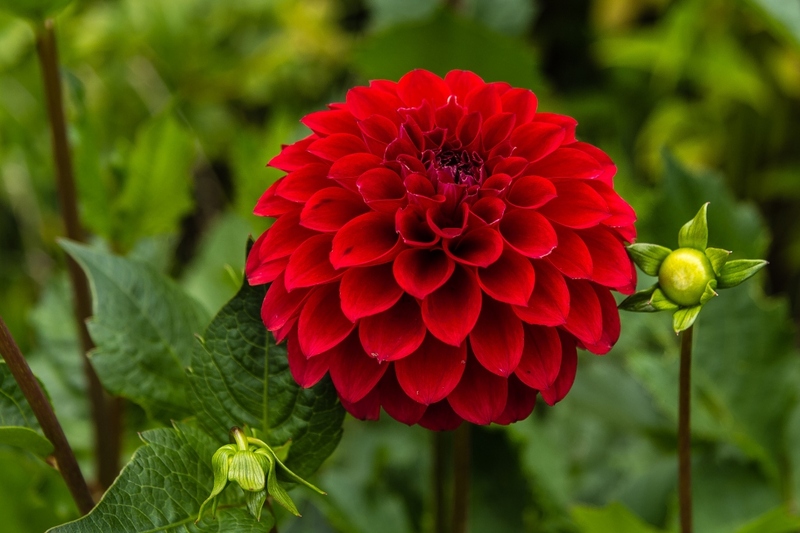 Dahlias need plenty of room and sun — space tall dahlias 80 - 100 cm apart, give shorter varieties 30 - 50 cm of space. In case of a late freeze, cover the young, emerging shoots with mounds of earth to protect them. Build up the soil all around the base of the plant to shelter it from the cold. The bulbs don't need a lot of water, but water them regularly after planting and during flowering, without getting the foliage too damp, a favourable condition for the appearance of fungi. Dahlias are insatiable! It's therefore important to feed them an organic fertilizer at the end of summer, in addition to the initial manure. You may also fertilize in the month of June, with compost or well decomposed manure, then cover with a wood chip mulch. It is possible to propagate your dahlias by splitting the stem 35 cm above the soil, especially to encourage branching in the case that the tubers only produce a single branch. To transplant your dahlias sown indoors, wait until the temperatures become mild, a warm soil is a guarantee of a good development! Plant your dahlias in rich soil, worked on 20 cm wide and deep, mixing some compost. Pour 1 liter of water at the bottom of the planting hole, position your dahlia and cover it with 8 cm of soil. Place your stakes at the same time and avoid hurting the tubers. Dahlias need space and sun: space the dahlias 80 to 100 cm high, the low varieties 30 to 50 cm. In case of late frost, mow the young shoots that emerge to protect them: accumulate soil all around the base to shelter it from the cold. In November, when the foliage starts to darken, cute the stems off 20 cm from the base and dig up the tubers. Store them in dark crate, in a cool (1 to 8°C), dry and well-ventilated room. To avoid rot, you can sprinkle wood ashes on the dug-up tubers before storing them. If you've taken your tubers inside, bring them out when the weather is nice and replant them again! Wait until the temperature is mild and the soil is warm to ensure good growth! Plant your dahlias in rich soil, worked to depth and area of 20 cm, and mix in a bit of compost. Pour one liter of water into the bottom of the planting hole, position your dahlia, and cover it with 8 cm of soil. Insert your support stakes at the same time to avoid damaging the tubers. Dahlias need plenty of room and sun — space tall dahlias 80 - 100 cm apart, give shorter varieties 30 - 50 cm of space. In case of a late freeze, cover the young, emerging shoots with mounds of earth to protect them. Build up the soil all around the base of the plant to shelter it from the cold.